View of “De Los Dementes, Ò Faltos De Juicio” (Of Lunatics, or Those Lacking Sanity), 2019. Mapa Teatro, a Bogotá-based “live arts” collective founded by Heidi, Elizabeth, and Rolf Abderhalden in Paris, has, since 1984, dedicated itself to transdisciplinary creation in the expanded theater field. Using ethnofiction to create symbolic and theatrical discourses around forgotten histories, this heavily researched, site-specific exhibition—the group’s first non-performance display in Europe, titled “De Los Dementes, Ò Faltos De Juicio” (Of Lunatics, or Those Lacking Sanity)—tethers the ore extraction in Colombia to the museum building’s past life as a general hospital whose operations were partly financed with gold from the Americas during the colonial period. In one room, fictional-historical medical documents, floor plans, letters, and an aureate Quimbaya cacique evoke this part of the site’s previous capacity as a mental asylum whose patients were confined to the basement. The second installation occupies an area not usually reserved for artworks: the Sabatini building’s sided stairs and vaults. With metal tracks, wagons, buckets, dim lighting, and clanking audio, the artists converted the space into a mine shaft. 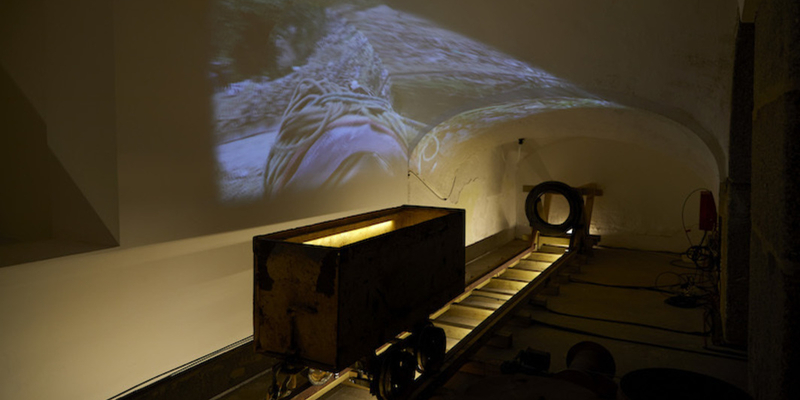 In the stairwell, a pulley system helps project a video—featuring images of the mules that assist precariat workers in Colombia’s Marmato mines, which are still functioning today—onto the steps, ceiling, and walls. Mapa Teatro asks nothing less from their viewers than physical exhaustion and real imaginative engagement. Only then may they arrive at meaning and experience.